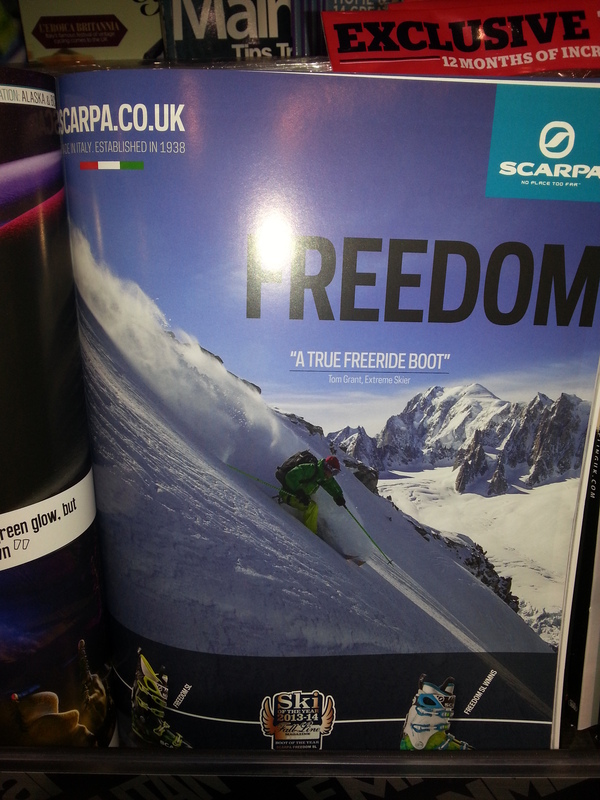 I’ve just seen Scarpa UK’s latest advert for the award winning Freedom SL which is a fantastic photo taken by Cedric Bernardini of me skiing the hanging shoulder on Aiguille du Tacul. Located at the branch of the Mer de Glace and Leschaux glaciers., its an aesthetic line visible from Montenvers and one of may favourite tours. Conditions were amazing with boot deep powder and I took my biggest skis on the 800 m skin in anticipation of the descent. Thanks to Cedric and Scarpa! This entry was posted in Landscape, Lifestyle, Skiing by Ross Hewitt - Skiing, Climbing, Photography. Bookmark the permalink.